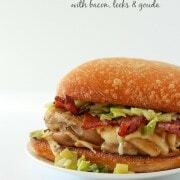 This chicken burger — or rather “burger” comes together with chicken plus only five additional ingredients, but it isn’t lacking in flavor! It will quickly become a favorite of yours. Remember when I made Chicken Caesar Chicken Tenders and told you all about a fun competition? 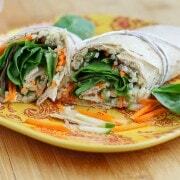 Well, I’m continuing in my partnership with Just BARE chicken, and it’s time to talk recipes! But I’ll back up juuuust a little bit and tell you about the process. This was a really fun challenge and stretched my skills in more than one way. To enter the contest, all people had to do was create an ingredient list consisting of chicken plus five ingredients. They also got to choose a category for their ingredient list — from categories such as sandwich, soup/stew, salad and appetizer. This contest garnered thousands of entries! Just BARE’s culinary expert Lisa Golden Schroeder then had the huge task of narrowing down that list to only 25 entries that she believed could be transformed into cohesive and delicious recipes with the addition of only salt, pepper and water (or nothing at all!). I (along with Tessa Arias of Handle the Heat, Monique Volz of Ambitious Kitchen, Cassie Laemmli of Bake Your Day and Meagen Wied of A Zesty Bite) each received 5 of these ingredient lists. We then had the challenge of choosing three and creating fun and unique recipes. And a challenge it was! 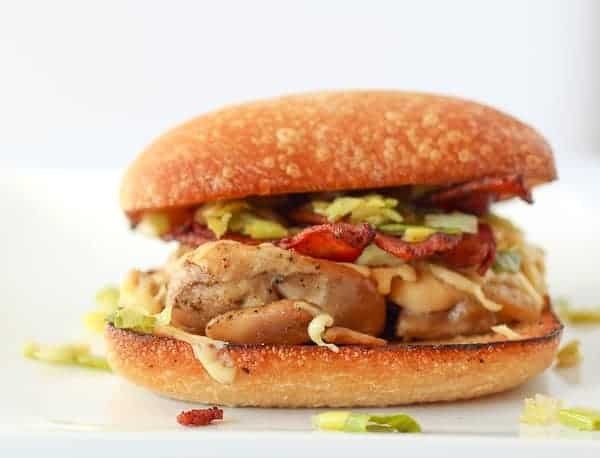 Remember to head on over to Just BARE’s Facebook page to not only get the ingredient lists for all these simple and delicious recipes (the full recipes will be posted to JustBareChicken.com in May), but also to vote for a winner! Just by voting, you’ll be entered to win one of five prizes — $250 in groceries! The hardest part of this challenge was not having oil as a “free” ingredient. But…thank heavens for bacon grease. It came in very, very, very handy in this recipe. Once you get the chicken baking in the oven (it’s brushed with Dijon and seasoned with salt and pepper for flavor), you’ll get started on frying up the bacon, followed by the leeks. You’ll save a little of the bacon grease to toast the ciabatta buns until they are nice and golden brown. All that is left to do at that point is to put together your “burger” and chow down! Heat oven to 375?F. Arrange chicken on a foil-lined baking sheet. Season with salt and pepper; brush with 2 tablespoons mustard. Bake about 30 minutes or until no longer pink in center (165?F on an instant read thermometer). Meanwhile, cook bacon in a large skillet over medium heat until crispy and browned. Drain bacon on paper towels, reserving 2 tablespoons bacon fat. Trim the tough green tops from the leeks and slice them in half lengthwise. Rinse well to remove any sand or grit. Thinly slice crosswise. Heat 1 tablespoon of reserved bacon fat in large skillet; sauté leeks over medium-high heat about 10 minutes or until tender. Place in a small bowl. Heat remaining 1 tablespoon fat in skillet over medium heat. Toast buns, cut-side down, until golden brown. To assemble sandwiches, spread toasted buns with mustard. Slice chicken and arrange on bottom halves of toasted buns. Sprinkle with cheese*, then top with bacon and leeks. Note: Place sandwiches under the broiler for 1 to 2 minutes to melt the cheese if desired, before topping with bacon and leeks. Disclosure: I was compensated to develop these recipes for Just BARE chicken but all opinions are as always my own. Excellent recipe, Rachel. I vote for your recipe every day. Hope you win–this sandwich recipe is definitely a keeper. In addition, I have bookmarked your website. I saw that picture than read the ingredients and my mouth opened in anticipation. I can remember when I first discovered chicken sandwiches. I couldn’t believe how much I loved them. Unfortunately it was during my ‘poor time’ as a young woman, so they became a treat. So I still have lingering feelings about them being special. That is STUNNING, Rachel. I’m goin’ in. Perfect, I love leeks and gouda but never paired them together before!! I love everything about this recipe. I wish I am having this sandwich for lunch now! I just drooled all over myself. I love the idea of this recipe contest and although none of mine got picked, I loved seeing the final results! This chicken burger looks amazing. 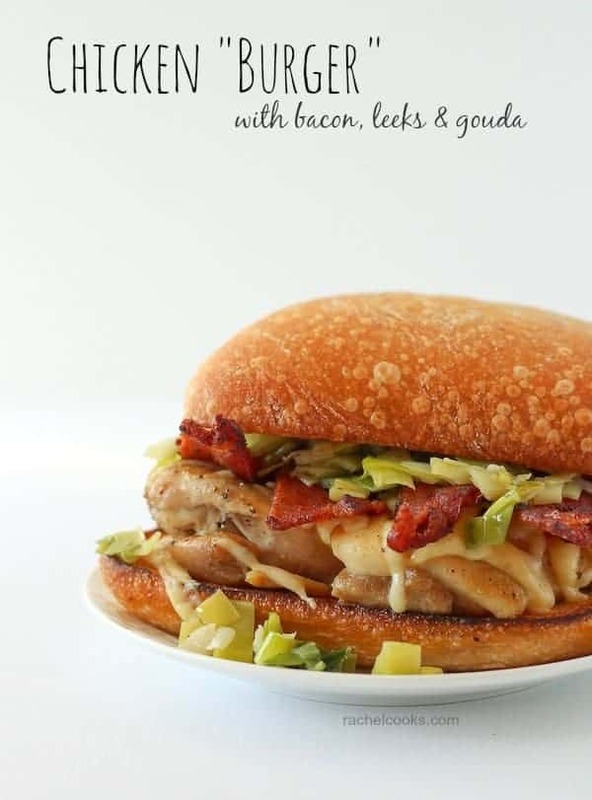 I love that you used chicken thighs for the burger – looks so YUMMY! That gouda is calling my name! I love these! Ok. This looks amazing! Love the flavor combo in ths!!! Looks fabulous! Of course you totally had me at bacon grease! Oh, we will definitely be having this around here. My hubby will be a happy man when I make this for him. How fun!!! I’d say you’ve outdone yourself with this one!! 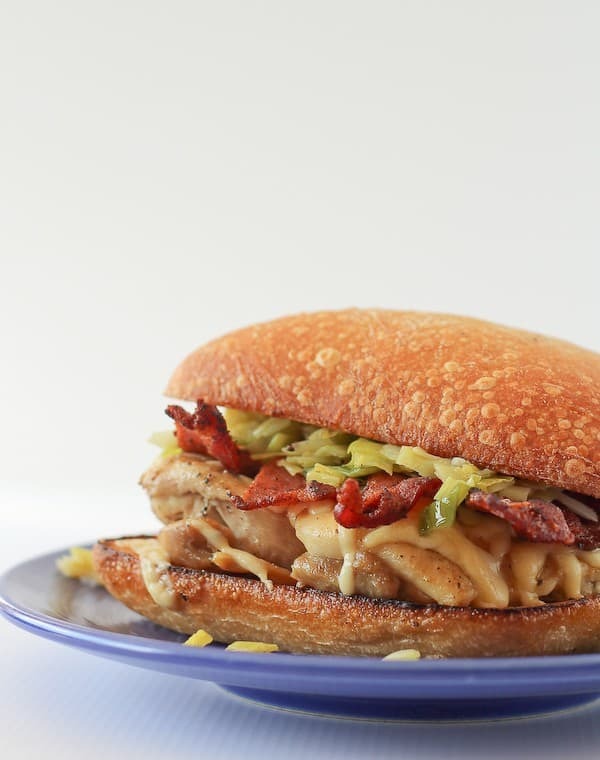 Bacon, leeks, gouda…..ahhhhh some serious heaven there. How exciting!!!! The chicken “burger” ingredients list is from me!!!! you made my list into an incredible sandwich!!!!!!!!!! Oh my gosh — that IS exciting! Thanks for commenting here and letting me know. I hope you win!!! Your list was my favorite of the lists I was assigned. How can you go wrong with bacon? Good luck!!! Love everything about this burger! All the layers! Want! You are making me SO HUNGRY! This looks amazing! My husband would love this. I love the flavors! This burger looks amazing! Love that beautiful side shot so I can see all the delicious filling…yum! Oh man…you had me at bacon grease. and chicken. and more bacon..and gouda. This look ah-may-zing Rachel! My husband is going to go bananas for this! 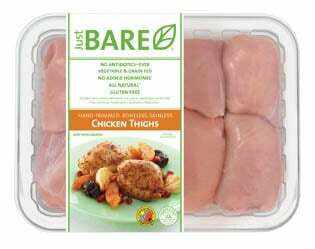 I just discovered Just BARE chicken…and I love it! Pinned!